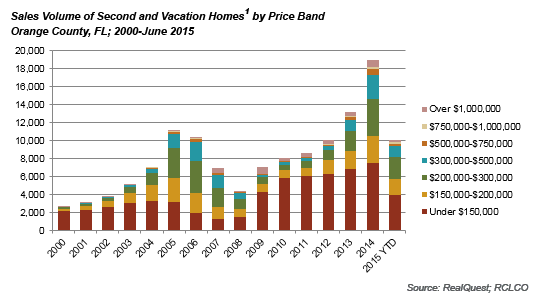 Our previous article on vacation/second homes focused on the national increase in vacation home purchases and the locations that have experienced this upturn. This article focuses on specific trends RCLCO has witnessed across the country in second home development. Second home development has lagged all other sectors in the recovery from the last downturn. 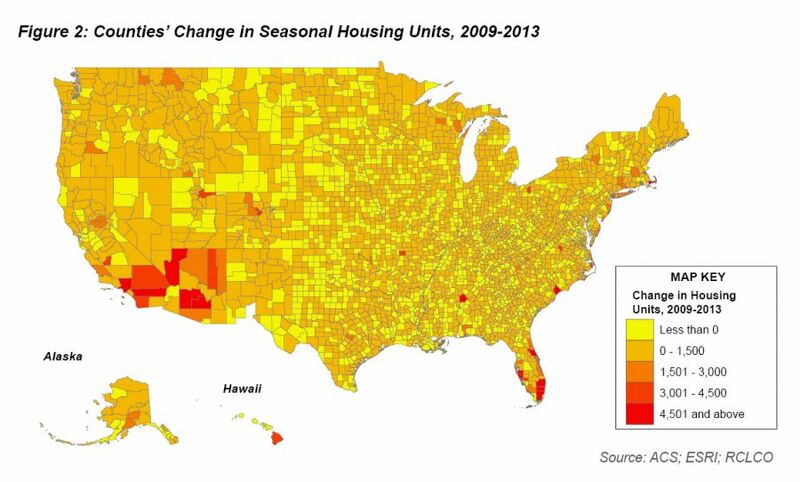 However, a National Association of Realtors1 survey showed an increase in vacation home sales in 2014 to a level above 2006 pre-recession highs, and we have witnessed areas in the country with positive trends in second home fundamentals. Wealthy buyers – Housing markets that are driven by high-net-worth purchasers, many of whom have done well in the stock market, and are close to strong source markets with high-end buyers, are performing well. Of the top quartile of households surveyed by the Federal Reserve,2 one-third own real estate other than their primary home. According to the National Association of Realtors,3 30% of all vacation home sales were all-cash purchases, and of those who financed their home, 48% made a down payment of 30% or more. Income-seeking buyers – Unlike investor buyers, these are second home purchasers who want to use the home themselves, but help pay for the cost with rental income. We have seen this trend all over the country. Offering these buyers the opportunity to put their home in a managed rental pool, locating the product near amenities, and providing concierge-type services for renters are key features to appeal to these buyers. Foreign buyers – Many parts of the country are seeing the vacation home market swell with foreign buyers. These buyers are increasingly interested in personally using their property for part of the year while still being able to earn rental income for the remainder. Pre-retiree/retiree buyers – Many second home communities have already been transitioning from purely second home communities to being both second home destinations and retirement communities. As Baby Boomers begin entering retirement, their second homes have in many cases become their retirement residences, and as a result smart developers have been creating new product targeting retirees in what were traditionally second home destinations. Buyers in these communities are looking for built product with on-the-ground amenities, and are gravitating towards water-oriented and warm geographies. Some are now looking to downsize and simplify life by buying new homes in communities where they previously purchased. In the Southeast U.S., cluster homes—typically smaller and requiring lower maintenance—are finding success as a less expensive alternative within amenity-rich developments in desirable locations. Many projects that started before the recession and still have excess inventory are finally hitting their stride, but not always with the original developer. They benefit from having infrastructure and amenities in place, and a lower cost basis than if they were being developed from the ground up today. Second home communities stalled during the recession are in the process of restarting their sales. They can offer product at a lower price than would be possible with a new community. Although in the past second home communities typically focused on lot sales, in many of these projects built product is selling faster than lots. Until excess inventory is worked through in these existing second home developments, it’s unlikely we’ll see a lot of brand-new communities competing head-to-head on price. 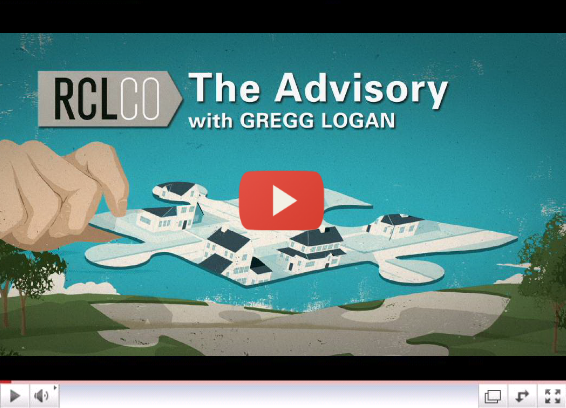 This is evident in Texas coastal markets, Texas Hill Country, and North Texas lakes. Even though the primary home markets in Texas more than recovered over three years ago, meaningful second home demand has not yet resurfaced, though well-executed projects with amenities and an established sense of place are doing fairly well. This trend is also evident on the Eastern Shore of Delaware. Two projects that are selling well, Bayside and Plantation Lakes, demonstrate this trend. Bayside is a well-executed, golf-oriented project that started pre-recession, while Plantation Lakes offers a distinctly lower price point targeting value buyers. 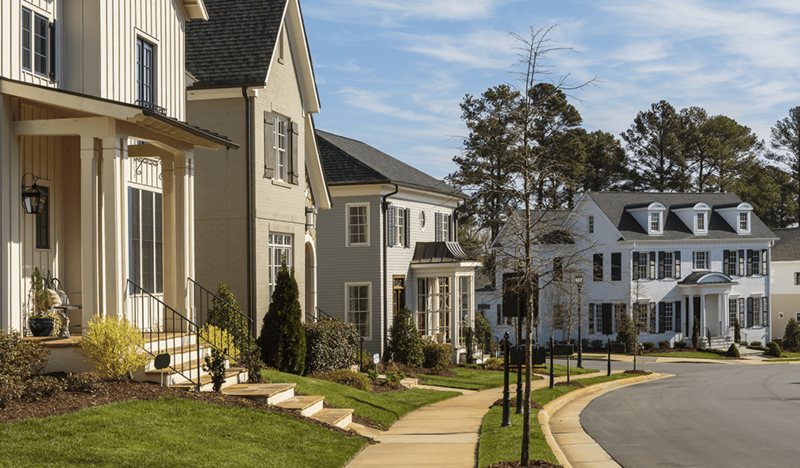 Pre-recession developments in the Carolinas are being reinvigorated by offering moderately sized, low-maintenance built product that capitalizes on premium views or are oriented around appealing amenities. This is in contrast to the lot sales and large custom homes that Carolinas mountain and lake communities focused on prior to the recession. In the West, ski projects outside of major destinations such as Vail and Park City have experienced a slower second home recovery. However, some ski resorts are beginning to focus on providing, and marketing, a year-round vacation so that buyers have more of a compelling reason to purchase whole ownership product. Heavenly Ski Resort is one example of a resort widening available experiential amenities outside of the standard ski season. Shared ownership has been slower to recover from the recession than the overall second home market, in terms of both volume and price. In 2013, 1,575 fractional and private residence club shares sold in North America, only a quarter of the peak of 6,450 shares sold in 2007.4 These sales occurred in 80 different projects across North America, translating to an average of approximately 20 sales per project. However, RCLCO has found that high-end fractionals in strong locations are selling well. Examples of this are Ghirardelli Square in San Francisco and Rancho Valencia in Rancho Santa Fe, California. This type of property is popular among buyers interested in using the fractional not only for vacations but to generate income when not in use, to make the higher price point more palatable. These buyers are particularly attracted to developments where there are specialized services available for renters of the units. An extensive package of well-executed resort programs and amenities helps attract second home owners in addition to resort guests. Many well-known resort hotels are either revamping their real estate program or considering offering for-sale residential product. Examples of this are Reynolds Lake Oconee in Greensboro, Georgia, and The Homestead in Hot Springs, Virginia. By already having a large menu of possible activities and amenities, these projects can appeal to both hotel guests and buyers. Established resort areas such as these already have the built-in infrastructure, which is increasingly becoming more expensive to develop, to provide families and hotel guests with exciting group activities while also allowing individuals to pursue their own interests. Successful communities are providing the setting for a range of psychographics and preferences—even within the same household. Buyers have been visiting these areas for years, and are comfortable with the locations and sense of security they provide. The vacation corridor in Orlando is hot, with targeted single-family product aimed at investors catering to visitors who prefer non-hotel lodgings. New, well-amenitized developments that are effectively targeting this segment of the market are selling single-family detached homes with five to 10 or more bedrooms. Typically purchased by foreign investors, these homes have appealed to individuals interested in investing their cash, in a place more secure than where they are from, typically seeking a 4% to 7% return. RCLCO has found a high correlation between price per square foot and proximity to resorts—the closer to the resort amenities, the higher the price per square foot. Our next article on second homes will take a deep dive into the Florida vacation home trends. 1 “Investment and Vacation Home Buyers Survey 2015,” National Association of Realtors, April 2015. 2 “2013 Survey of Consumer Finances,” Federal Reserve, September 2014. 3 “Investment and Vacation Home Buyers Survey 2015,” National Association of Realtors, April 2015. 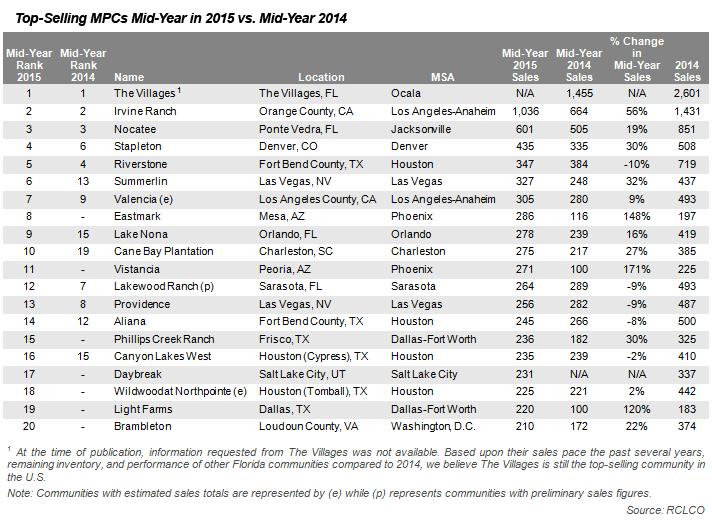 4 “The Shared-Ownership Resort Real Estate Industry in North America: 2014,” Ragatz Associates, April 2014. Article and research prepared by Melina Duggal, Senior Principal, and John Cavallo, Associate.